This time I did something different: Used an iPhone XR side-by-side, and alternating with an iPhone 6s, so I could get a better, more real-world look at whether it's worth the upgrade. iPhone XR has been out for just over a month. After doing my initial iPhone XR review, I've still been using it alongside and alternating with an iPhone XS. For the last few days , though, I've instead been using it alongside and alternating with an iPhone 6s. Why a 6s? Because I wanted to get a sense not just of how cool the new colors are, though they are, or whether the display and camera system were dealbreakers compared to the iPhone XS, which really depends on the individual, but how much of a difference the upgrade will make to a real person in the real world. Rather watch than read? Hit play on the video below and subscribe for more! A lot of people considering the XR, people who don't get a new phone to review every couple days, weeks, or months, have been using the same phone for a couple or few years already. That's the 6s. Maybe the 6, SE, or 7. But mostly the 6s. And, if that's you or someone you're close to, I want to take my head out of the tech bubble for a minute and put myself in your shoes. Maybe you're ready to upgrade and you're considering giving up the familiarity of the Home button — you know, the one only tech hot takers ever thought that was boring — and try out the full screen future. But you're wondering if the $750 up front or the few bucks extra on your carrier plan is worth it for the iPhone XR. Whether it will provide value to you or yours beyond the price. Just over a month later, that's what we're going to answer. One of the biggest things going for iPhone XR is battery life. Out of the box, it gets 25 hours of talk time, 15 hours of web browsing, 16 hours of video playback, and 65 hours of audio. That compares to 14 hours, 10 hours, 11 hours, and 50 hours respectively for an iPhone 6s. Either way, it makes a real difference. Not just because of the capacity but because of the workload. Back when I first got my iPhone 6s at launch in 2015, my typical usage was just starting to get more demanding. Snapchat and Facebook have come and gone for me already, but they were huge battery hits when I was using them. Instagram and even Twitter still are. Thanks to video and stories with rendered and geo-based filters, they're always downloading and displaying media, pulling GPS, and otherwise hitting the battery. Hard. I watch a lot more YouTube now than I did back then, not coincidentally, and my single biggest battery blaster remains Pokemon Go, which didn't exist when iPhone 6s launched but debuted the following summer and its combination of screen-on time, data, rendering, and GPS just brought most phones to their knees. Or, rather, red zones. Just for fun, I took both phones out for Pokémon Go's community day this past weekend and even with both batteries near full health, the iPhone 6s was almost dead at the end of four hours but the iPhone XR could have easily gone 4 more. I quit before it did. I said in previous years that Apple had to start testing not for the light web browsing and email checking of the past but the social, photo and video, and gaming realities of the present. And with iPhone XR, even more than iPhone XS, they have. One month later and I want this battery path to be Apple's new normal. You can play Fortnite at 60 frames-per-second. I mean that literally. Emphasis on the * you * can. Me, personally, I can die at 60 fps and I can die well, but if you can actually play and win, you can do it pretty damn gloriously on the iPhone XR. Same goes for pretty much any high-end game that supports it, but also heavy-duty computational photography filters, video effects, machine learning models, and more. AR quick view, by the way, where you tap a web link and suddenly you're in augmented reality is one of those features that make you think you're living in the future. We knew from the start that Apple's A12 Bionic was going to be a beast of a processor, but that's really born itself out. Rendering short video feels like saving images and saving images feels like… like closing them without saving. Instant. I don't know. Because there aren't that many pixels to push around, even the interface moves like it's on a hair trigger. Literally nothing outside the terrible, freeze-prone coding of the Instagram app — can we please go back to Objective C or Swift? — slows it down. It feels like you're only ever constrained by the speed it takes to pull data off the storage — which is also silly fast — or off the internet, which is about the only time anything ever really spins or makes you wait. Two years ago, Portrait Mode could peg an iPhone 7. Last year, AR an iPhone X. This year, some of that kind of stuff can still come close, but there's just so much headroom that I think it's going to take a year or two before we see anything really put A12 through its paces. And, since one of the reasons Apple puts so much power into its chipsets is so that they'll be able to handle updates for the next 4 or 5 years to come, if you're planning on keeping an iPhone XR anywhere nearly that long, even as a hand-me-down, it should legit more than last. For most people, the biggest change moving from an iPhone 6s, or any traditional iPhone, to the XR will be the loss of the Home button. Again, tech hot takers can bemoan Apple's quote-un-quote boring design all day long, but for everyone consistency was a tangible user benefit and the Home button was a tactile escape hatch that could reorient us whenever anything got the least bit dodgy or confusing. That's probably why, more than a year into the age of iPhone X, we hear anecdotes about how well last year's iPhone 8 and 8 Plus are still selling. Not just because of their discounted price but because of their consistency with previous generations. Their familiarity. 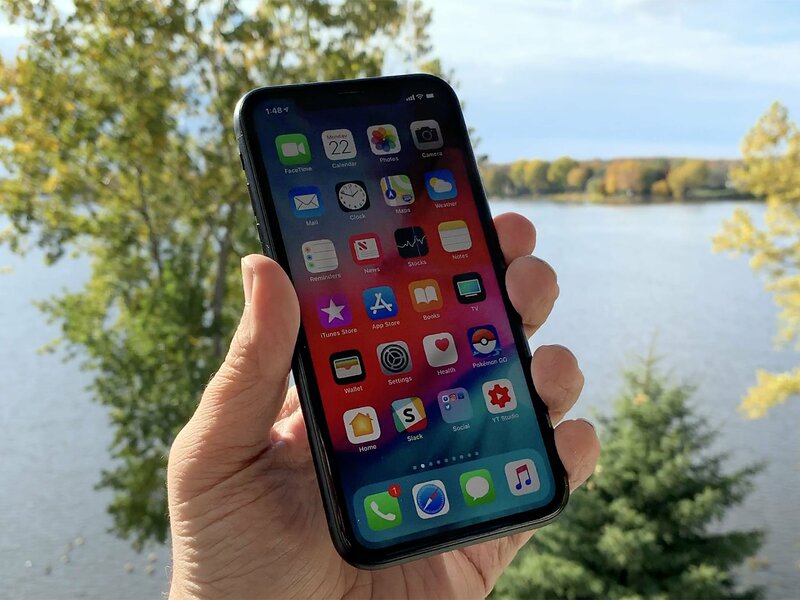 iPhone XR, though, brings that next-generation, almost full-screen iPhone experience to the table, and for considerably less than the more expensive than ever flagships. In fact, the XR screen is pretty much as big as an entire iPhone 6s or 7 or 8, case and all. In place of the home button is an upward swipe and gesture-based navigation system that took me about a day to get used to. Now, a year later, it's not just tough to go back, it's slow. In place of Touch ID is Face ID. There are a couple edge cases where it doesn't work as well, like if you want to reach over and unlock the phone or if you want to have multiple people registered. But in every other case, it's also not just faster but so fast it feels almost transparent. Since the iPhone XR has the same, improved True Depth camera and faster A12 Secure Enclave as the XS, you're not giving anything up for the difference in price. Same with the navigation. It's just best in class now. I feel like the iPhone XR display has been beaten to undeath now and all we have are zombie lich arguments left. While some people who's knowledge of display tech seems to go only spec sheet deep raised a lot of fuss about the resolution and pixel density before launch, which is kinda like complaining about a Ferrari just because it has fewer tires that a Mack Truck, anyone who knew anything about quality vs. quantity and, you know, context, took a wait and see attitude and, generally, liked what they saw. The truth is, Apple's display team has gotten so good at everything from color calibration to color management that you can put an LCD iPhone XR next to an OLED iPhone XS and, unless you're looking for deep, deep black and can discern high contrast ratios, scarcely tell the difference. Which is insane, given how different the two display technologies are. Since filming my initial review, I've also heard from a lot of people who suffer varying degrees of vertigo from the variable refresh rates on OLED but who don't have that problem with LCD, and so are super happy Apple is offering both in the new design. The bezels remain a bit thicker, not than the top and bottom on an iPhone 6s or similar, but on the sides, and then there's the notch. The black faceplate helps minimize it and while you can never not see it, you do stop noticing it, especially because the screen, by comparison, feels so much more expansive and opened up. It's the same density at the 6s, 7, and 8, just with more pixels to fill out the edge-to-rounded edge display, and with all the DCI P3 wider color gamut, TrueTone dynamic color temperature matching, and other advances Apple has made since. You can even put it into Display Zoom mode, like Plus and Max-sized iPhones, so everything looks bigger and, if you had been squinting to see things before, you won't have to any more. About the only step back you'll notice is 3D Touch, if you use it a lot. The XR doesn't have it. It has Haptic Touch instead, which, while ok in the few areas it's implemented, just isn't a real replacement yet. If all you did was adjust levels in Control Center, you may not notice. If you peaked and popped all over the place, like I do, you'll miss it, or at least find the XS much more attractive. There are going to be people who want to upgrade to higher density and to OLED on the XS, and fair enough, but for everyone who doesn't give a damn about the display technology, and who doesn't look at the their iPhone from less than a foot away, you won't notice a difference. I do care, deeply, and a lot of the time I forget which one I'm looking at. I also care about the cameras a lot, and this has been the biggest sticking point for me. I've lived on a dual system and 2x since iPhone 7 Plus and it's been a challenge to go back to shooting with just one and just wide. And, you know, it's been really interesting. The sneaker zoom. The framing. All of it. It's like shooting with a 6s again but, though both cameras are 12 megapixel, the better aperture, higher quality sensor, and all the power in the A12X image signal processor makes them feel worlds apart. Especially in more challenging settings like lower light or higher movement. Apple's purely computational portrait mode on the XR ends up being a very different beast from the fusion version I've been using since iPhone 7 Plus and still use on XS. I still prefer the latter but being able to shoot with far greater flexibility in lighting and range has been liberating. Yes, it's still limited to humans and their faces, which is a drag, but since Apple built a unique virtual lens model just for the wide angle, different from the telephoto, you get shots that the the previous portrait modes could simply never deliver. I still wish the XS offered both, but with the Depth Control now offered even in preview — when other vendors still can't even do the basic depth effect in preview — the XR has proven more than solid all on its own. That's especially true for shooting video, where the XR, like the XS, can shoot in extended dynamic range up to 4K 30fps, and regular dynamic range up to 4K 60fps, and in stereo, which works better than it has any right to given you're just using a tiny camera phone. It really makes iPhone XR competitive not with other phones but with other cameras. Stereo playback is also great. I've watched a ton of shows and films with the new wide stereo speakers and it's the first time I've felt I didn't need to where headphones to actually enjoy what I'm listening to, and I've never been particularly fussy about audio. Portrait Selfies, Animoji, Memoji, and all the AR on the front is exactly the same as the XS as well, and lightyears ahead of the selfie cams on older, traditional iPhones. Yeah, some of it is a gimmick, but when it's approaching the holidays and you can just Santa or elf-yourself, especially in the new group FaceTime feature, a few gimmicks aren't such a bad thing. This is the part of the re-review where I'm supposed to make up a bunch of stuff I hate about the iPhone XR just so that people in the comments won't call me biased, or just of being a fanboy, because the internet loves to mistake cynicism for intelligence and being negative, even to the point of incredulity, with being cool. Well, screw that. iPhone XR is legit a great product and it's going to be a great phone choice for a lot of people. For me, personally, even though I like the colors and size of the iPhone XR the best, the OLED-enabled HDR video and the dual camera system will keep me on the iPhone XS. But my job isn't just to review technology for me or people like me. It's to review it for everyone.